A man knows that every detail is important. The wrong tool could cause you to cut without precision or undermine your natural talent. The question is how do you choose the right saw? This is where an honest Excalibur scroll saw review will come in handy. The Excalibur scroll saw is known as one of the most versatile saws of its kind. It can handle scrolling, toy-making, intarsia, or woodwork, just to name a few features, but nothing is perfect. The following are a few pros and cons to consider. Q — What kind of drive system does the Excalibur scroll saw have? A- — The system comes with a belt drive mechanism, which is rather unique for these types of saws. It gives the machine the ability to handle strain for long hours. Q — What is the tilt of the Excalibur scroll saw? A- — The saw can tilt as much as 45 degree angle without sacrificing stability. Keep in mind that this is a head tilt, which is unique since most scrolls tilt with the table. A table tilt is unstable and may cause shaky cuts. Q — How large is the table or work area? A- — You are looking at a large table surface. It is 12 inches by 18 and a half inches in total. Q — Does it come in more than one size? A- — Some out there need different sized scroll saws, which is the reason why the company actually offers the standard 16 inch saw, but it also offers the 21 inch saw or the 30 inch saw. This might not be a perfect saw, but it does come with some features that are hard to find. This gives some people the ability to complete tasks that might have been impossible with other scroll saws. 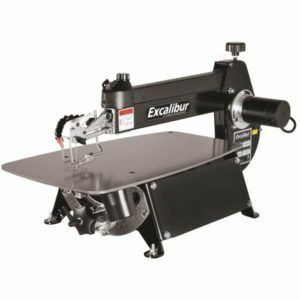 Q — How much does the Excalibur scroll saw cost? A- — Now, this question really depends on the size of the saw that is purchased and price fluctuations. The cost usually falls somewhere between $579 all the way to $950. The price might be a little high for some, but there is no doubt the Excalibur scroll saw is an exceptional tool for certain jobs. It gives you stability and mobility for jobs that require a little more precision.